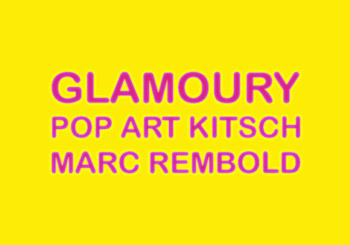 For the first time in Switzerland, the Laleh June Galerie, Basel, presents Glamoury Pop Art Kitsch Marc Rembold, November 19, 2009 – January 16, 2010. Admired for his living colours, changing spectral colours, Marc Rembold has always developed a protean aspect to his art. His career features a constant dialogue between paintings, multi-media installations and objects. His work, organized by series – Light in Colour, Pure Pigments, Glamour, Filimini Maximalisme, Liquids, Light Sculptures, Deja-vu objects – underlines Marc Rembold self-proclaimed “glamoury pop art kitsch”. Rembold has developed his own artistic language. During the early 1980s, his own colour concept “Light In Colour”, defined as living colours, which they change colour with the temperature of the light, was quite revolutionary of his time and later approved by automotive industry, fashion and cosmetic make-up. Marc Rembold expresses a very personal connections to fashion, pop, electro and trance music. The electro pop colours and music and glittery “glamoury” 24 karat of gold materials in Glamoury Pop Art Kitsch Marc Rembold at Laleh June Galerie, Basel, immediately manifest to the eye un monde de rêve, l’âge d’or as Rembold reveals a “manifestation of the immaterial to material, invisible to the visible”. Marc Rembold’s Glamour recent works – LuxeLux and Lux paintings and Immaterial material installation – with 24 karat of gold in their immaterial and material forms, which testament the luxe phenomenon, and its interrelationship with the material world and art, are among works in Glamoury Pop Art Kitsch Marc Rembold. The exhibition also comprises of a group of familiar objects sculptures in glittery “glamoury” 24 karat gold, Golden Globe and Golden Car, symbols of livelihoods, which reflects Marc Rembold’s imaginary dream glitzer world. Rembold’s Tube Now And Tomorrow, goldglitt 24 karat of gold mounted on plexiglas tube mounted on wood with two imaginative globes (the globe of now and the globe of tomorrow) is defined separating the distance from today to tomorrow, faces his Blue (1995), paying tribute to the blue of Yves Klein. Marc Rembold since early 2000s has exhibited internationally. Rembold was born in Zurich, Switzerland. He currently lives and works in Basel. The opening will be on Thursday, November 19, 2009 from 5 to 9 p.m. You are cordially invited to meet with the artist. We are pleased to provide you with visual material on request, please contact Laleh Bazargan Harandi (info [​at​] lalehjune.com) or +41.61.228.77.78.